Everybody knows it rains a lot in Seattle, so it was a no brainer that most of the Seattleite couples get married during the summer. However, don't forget about the fact that it is also a great time to take engagement photos. Jessica and Michael live in Monroe, Washington which is a suburban area about an hour away from the city. They enjoy a more countryside environment, but they also immerse themselves in the city every once a while for salsa dancing and visiting friends. It was a sunny day when I took them around downtown Seattle for their engagement session. Besides from taking pictures with some iconic landmarks in downtown, I also became a tour guide and took them to some hidden gems such as the Nest at Thompson Hotel. It was a rooftop bar overlooking the Seattle waterfront. An engagement session is not only giving the engaged couple an opportunity to take pretty photos, it also gives us an opportunity to get to know each other, letting the couple know what my working style and approach are so they could feel more relaxed being in front of the camera on the wedding day. And this photo achieved just that! 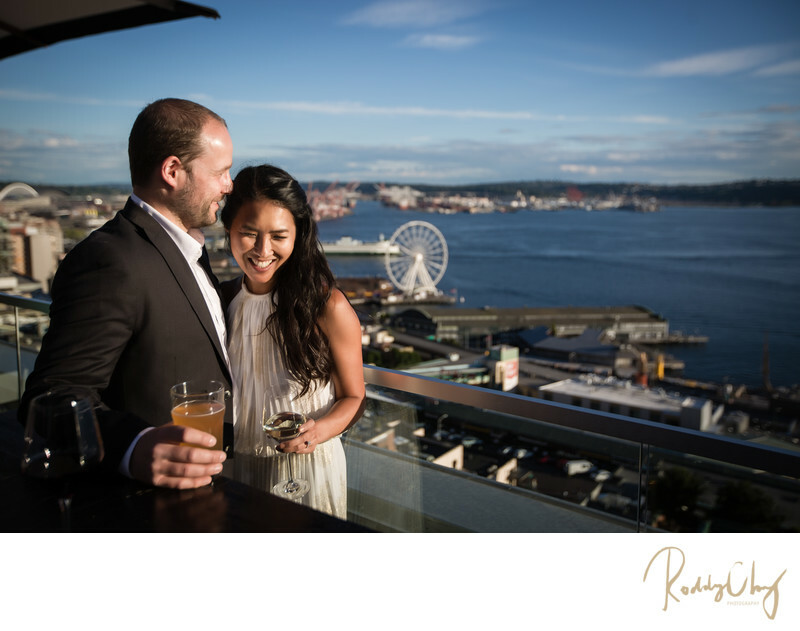 It was a candid shot in which the couple were just enjoying the drinks with the astonishing view in the sunny Seattle. Location: 110 Stewart St, Seattle, WA 98101.